That was the vision a few like minded folks inside Cisco saw about a year ago. So we set off on a path to build something that was free. The naysayers said that it could be a threat to our existing hardware business for telepresence. Well, maybe in some cases. But mostly, it extends the calling circle for those that already have telepresence. And for those that don’t, they get to see what all the fuss is about at no cost. Maybe then once you are hooked, you plunk down some cash to purchase a hardware endpoint that will give you more features and flexibility the likes of which a desktop app can’t compete with. So after much rebranding, we launched https://www.ciscojabbervideo.com/ today! 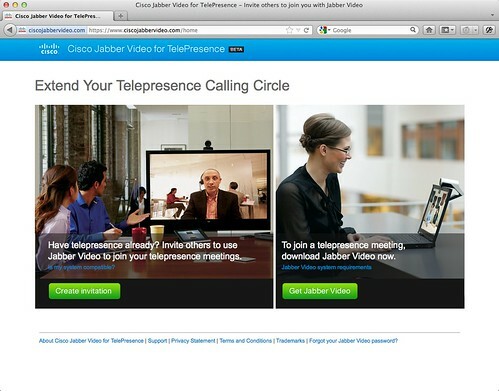 After filling out a quick form to register for an account, you can download the telepresence softclient now known as Cisco Jabber Video (formerly Movi). Then dial up your friends on telepresence and talk in full HD video (if you have an HD camera). So if you have family, friends or co-workers that you need to meet with, get off of that Skype crap and give this a try. You won’t go back. Call me at 7036511630@alpha.callway.com if you wish.